View More In Store Sign Holders. 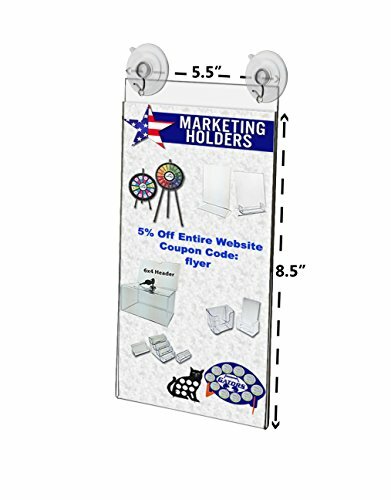 Lot of 2 - This versatile 5.5"W x 8.5"H window mount ad frame / sign holder is perfect to display advertisements, signage, notices, instructions, menus and more. Made of durable clear acrylic, the sign holder is easily mounted to windows or glass doors with the included two suction cups with hooks. USA made suction cup is built with unique reinforcing rings for added strength and long term holding power, and the steel hook is made of corrosion-resistant plated steel.